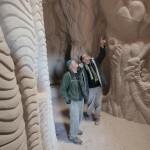 In his thirty-nine-minute documentary, Cavedigger, director Jeffrey Karoff brings us the extraordinary art and inspiring story of the struggles of Ra Paulette, an artist who has been carving caves, creating his magnificent architectural-like wall sculptures and spaces, in northern New Mexico for the last twenty-five years. Alone and using only hand tools – a shovel, mattock, wheelbarrow – Paulette scraped and carved the soft, sandy cave walls, guided only by his powerful vision as his blue print. 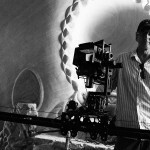 The film is about the artist’s endless devotion, energy, effort, persistence, and talent. Where most artists would give up easily when the reward does not come following the hard work, Ra Paulette’s faith, belief in, and passion for his art proves to be unbreakable. He continues with his efforts in spite of the many obstacles in his way, such as not having sufficient funds to go on with his work and, at times, having to fight in order to maintain his artistic principles with regards to his differences with his patrons. Ra Paulette proves to be a man of solitude, a visionary, an outsider artist, self-taught without real contact with the main stream intellectual values of today’s art world and any pretentious aspects of it. He creates his art not for the glory, fame, or money, but to just obey the force within him that makes him go forward. In that, his mind and his imagination are pure, bold, free, unspoiled, and completely unconventional. 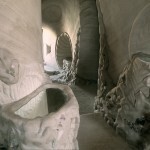 Paulette brings familiar and organic shapes, forms, and motifs found in nature all around him into the interior spaces of his caves, which are uniformly of gray, white, and beige earth colors, providing the cinematographer a great color palette from which to choose. There is a very beautiful, surreal sense of a misplaced reality in this film, which I love. At times, as I was watching it, I felt as though I were watching a man dreaming a very surreal dream, and somehow, I was allowed to be walking into his dream. As I continued watching Ra Paulette dig and dig in such a rhythmic manner, he seemed to be like a man repeating a word of prayer without needing to know its meaning, but just praying for the sake of self-realization. He seemed as though he were a spiritual man in a temple, completely connected with that higher essence and source within himself. Yet, he is that genius; he is that undiscovered, undervalued profit of art, touched and embraced by the mighty god of art itself. Walking out of the theater, I was thinking of how Jeffrey Karoff, as the director of the film, had on his hand a story that was powerful and an artform. The story is uniquely magnificent and large in talent. We all know that if you allow it, the story becomes larger than the art itself, and it can swallow the art. Karoff, however, managed to beautifully bring these two – the story and the art – together, to a perfect point of balance and harmony. 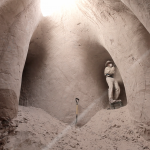 Much deserved, Cavedigger won the Best Non-European Documentary award at its world premiere in March at the European Independent Film Festival. I certainly would like to see more films by him in future. Following viewing Cavedigger at the Newport Beach Film Festival, I had the opportunity to sit with its director, Jeffrey Karoff, for a quick Q&A about his film. Here are some highlights from that session. Ra Paulette is an unusual artist, literally and figuratively underground. How did you come upon him? Unusual for sure. I think he’s the only person ever to dig caves as an art form. We have mutual friends, and I saw a cave of Ra’s 10 years ago. The impact was visceral, like seeing something grand in nature. That moment lit the fire of interest, but it took me a long time to figure out a way into the story. I should say that the story I didn’t want to tell was simply a process story – that is, this is how an artist creates his art. Those aren’t films I particularly like. After I spent some time with Ra I understood that he was a very unusual man, and mainly that he struggles mightily to maintain his vision. The dynamic is universal: creative expression versus money, and even in the deep hills of Northern New Mexico, one man with a shovel and a wheelbarrow faces those problems. There’s a line in the film where one of Ra’s patrons, who has commissioned a cave, compares their dynamic to Michelangelo and the Cardinals. Yes, the reference being that even the great artists had to serve some master. I’m not sure how much actual direction Michelangelo took, but the dynamic was as true then as it is now. In Ra’s case, he’s had to go to extraordinary lengths to avoid the long arm of The Man, evidenced by the end of the film. Biography doesn’t offer an easy or automatic structure for a film. How did you find yours? From the beginning I had assumed that any film about Ra would have a making of a cave as its structure, starting with the first pickaxe in the ground and ending with a cave’s completion. Over the years, I missed the starts of many of his caves, I just wasn’t in touch with him. But then, my cinematographer, Anghel Decca, and I were there on the day that he broke ground on his Magnum Opus 2. I was ecstatic — until I asked him how long the project would take, and he answered, ’10 years’. So much for that idea. You instead ended the film with that first pickaxe. Yes. And instead, the structure came out of an exploration of how Ra was working under a kind of yoke of commissions that were constraining his expression to finally deciding that he needed to risk all to express his deeply felt vision, unobstructed. So in a way it’s a liberation story – a bittersweet one. Many find it sad, because he ends up with no patron at all, and obviously hurting for money. But he’s internally a happy guy. Tell me about your process in the edit room. How long did it take? Erin Nordstrom at Optimus cut the film between commercial jobs, so it took us about six months to cut. I knew from her previous work that she is an instinctual storyteller, so I could let her go to some extent on her own. I culled through all the footage first and created a series of ‘stringouts’, scenes roughly cut together, based on subject matter. Then I put up a structure on the wall with post-its. Erin used my structure and stringouts to do a first cut. With the exception of one scene we lost, the film never really varied from that first pinned up structure. 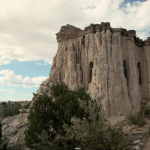 We will be having a screening at the Center for Contemporary Arts in Santa Fe on July 9th, with both Ra and me present. I have entered the film into many festivals for later in the year, and I’m beginning to talk with distributors. Eventually Cavedigger will be available as a DVD or VOD. I also plan to update the website with Ra’s progress on his current project. The best way to stay in touch is through facebook.com/cavediggerdocumentary or to sign up at cavediggerdocumentary.com.